In the very first scene of Oceanside, Gwen asks her husband “Can you fix those lights? They are not angled at all, it’s killing me.” When Tommy later angles the light fixtures on the patio, replaces the bulbs, and turns them on, they appear to be controlled by a visible switch on a post. In fact, the switch itself does nothing. Carter Miller, MRT’s Lighting and Sound Supervisor, has carefully prepared wires by running them unseen along the back of the posts and off the stage to special circuits. As a result, the lighting designer can control the intensity of those bulbs from the computer light controller. So when Tommy uses the switch on stage, a number of things happen: First, the Stage Manager, watching from the back of the theatre, signals the Light Board Operator. That Operator presses a button on the lighting console. 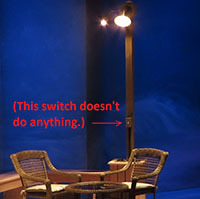 The button enables the lighting controller to adjust the levels of all the lights on stage—the patio lights, as well as the stage lights hanging above. Each of these changes are pre-recorded and saved in the controller. Thus the patio comes alive, seemingly at the hands of an actor. In truth: manipulated by unseen wires, an unseen computer, and unseen people. Any appliance or functioning device on stage is referred to as a practical. If there’s a sink on stage and water needs to come from the pipes then it’s a “practical sink.” In Oceanside, there are nine practicals onstage: the three bulbs on the patio, the floor lamp, the table lamp, the three lights along the grass, and the TV over the fireplace that briefly plays news footage during Act One—visible only to a handful of seats in the house. All of these appear to function like any appliance in your house, yet all have hidden wires running inside the stage set, and are controlled from far away (except for the TV, which just works like… well, a TV). From a design perspective, practicals are a great way to enliven a room. The quality of light from lamps and TV’s is familiar to all of us because we use them every day. When we see people on stage in a realistic setting with practicals, we can immediately relate to the space on stage. Designers use practicals to motivate light sources and create the appropriate mood for a scene. All the practicals on the Oceanside set were researched for authenticity, and placed in positions that are evocative as well as useful as light in and around the house where the play is set. They also help to define distinct locations on a set with very few walls. Draw a line connecting all the practicals in Oceanside, and you will see that they form a ring along the edges of the stage. (see photo at top of page.) This was a deliberate design choice which emphasized the variety of spaces (interior, exterior, patio, grass path) in the play.